Isolated showers and thunderstorms. Mostly cloudy, with a steady temperature around 58. 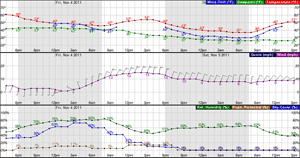 Southwest wind around 11 mph, with gusts as high as 18 mph. Chance of precipitation is 10%. A 10 percent chance of showers and thunderstorms before 9pm. Mostly cloudy, with a low around 38. West wind 6 to 11 mph, with gusts as high as 18 mph. A 40 percent chance of showers and thunderstorms, mainly after 3pm. Mostly cloudy, with a high near 57. West wind 6 to 11 mph, with gusts as high as 18 mph. A chance of rain showers before 2am, then a slight chance of rain and snow showers between 2am and 4am, then a chance of snow showers after 4am. Some thunder is also possible. Mostly cloudy, with a low around 32. West wind 8 to 13 mph becoming light and variable. Chance of precipitation is 50%. Little or no snow accumulation expected. A chance of snow showers before 8am, then a chance of rain and snow showers between 8am and noon, then a chance of rain showers after noon. Some thunder is also possible. Mostly cloudy, with a high near 45. Northeast wind 5 to 9 mph becoming east southeast in the afternoon. Chance of precipitation is 50%. Rain and snow showers likely before midnight, then a chance of snow showers. Some thunder is also possible. Cloudy, with a low around 31. Chance of precipitation is 60%. A chance of snow showers before 11am, then a chance of rain and snow showers between 11am and 1pm, then a chance of rain showers after 1pm. Some thunder is also possible. Mostly cloudy, with a high near 48. Chance of precipitation is 30%. A slight chance of rain showers, mixing with snow after 10pm, then gradually ending. Some thunder is also possible. Mostly cloudy, with a low around 31. A slight chance of showers and thunderstorms. Sunny, with a high near 60. A slight chance of showers and thunderstorms. Mostly sunny, with a high near 63.